Viacom wanted one responsive video layout for MTV, Comedy Central, VH1, Spike, and Logo to reduce the time required for upkeep and updates. 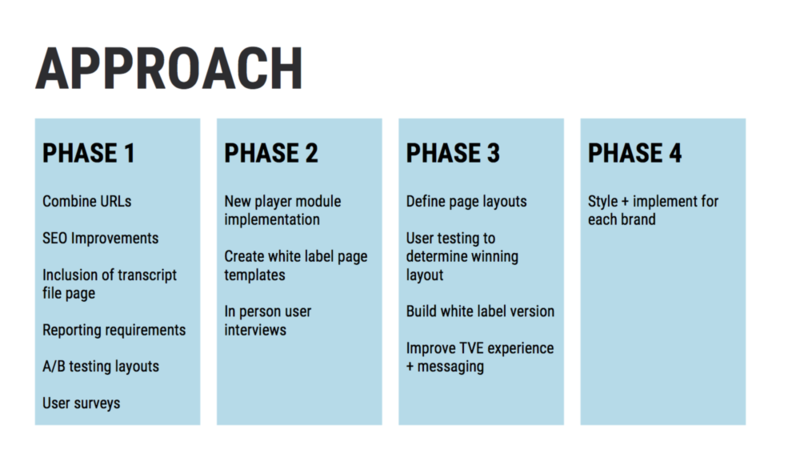 As Viacom’s bread and butter is its video views, redesigning the video player was a task that had to be thoroughly proven and bulletproof or else it could cost the companies millions. While this may seem like a simple layout change, months of hard work got us to the new design and buy-in from 30+ people across all the brands. This page is the reason why a majority of our users come to our sites, so every change had to be deliberate. And while we were at it, we also had to figure out how to increase video views. Though some of the original pages look deceptively similar, each channel had their own way of doing things -- different metadata, character limits, number of colors/fonts, etc. It was these minute details that could make or break the buy-in for the redesign and, ultimately, the change itself. The first step was to get an understanding of what we were dealing with internally: tech constraints, types of shows across all the brands, specific pages that would be involved, SEO impact, current analytics, brand needs, ad requirements, legal requirements, etc. While getting a lay of the land, we also talked to users about their video consumption habits. We came up with a number of assumptions, but before any of them came to play, we had to test. It was a multi-step undertaking to get to what you see above. 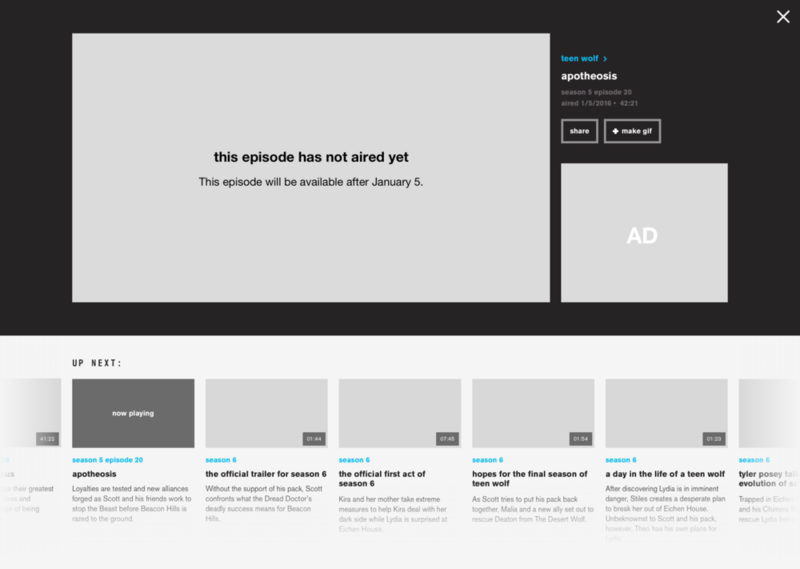 Each state of the page was meticulously thought out — if the user was watching a clip vs an episode, if the user was signed into their TV provider or not, if the video had explicit content, if it was exclusive footage, if it was an old sneak peak and the following episode was already available, the list goes on. The first brand received the new redesign in December 2016. After ensuring that we had in fact increased video views and had not negatively impacted our users (we checked our unfiltered feedback on Twitter and Qualtrics regularly), we rolled out to the other brands in stages. By February 2017, all five brands had the new layout. TVE — We made it easier and quicker for users to find their TV provider and log in. We also provided 24 hour access to those who did not have a cable subscription. Up Next Logic — We changed the logic for what videos appear after the user’s initial selection. This logic varies depending on the type of video and type of show the user is watching. We tested our logic against varying machine learning algorithms from third-party vendors, but my original logic still proved the most successful. Ad Placement — With the new redesign, we were able to keep an ad in constant view which, of course, increased revenue. Gotta get that ad money. Since this project was a success, other pages were getting similar treatment. When I left Viacom, the plan was to rollout to other brands both domestically and internationally. This is still in the works.